Merriam-Webster defines stop-motion animation simply as “a filming technique in which successive positions of objects (such as models) are photographed to produce the appearance of movement.” Like traditional animation, it is a painstaking frame-by-frame process, but unlike regular animation, you need actual physical models. With 24 frames per second of film, that’s a lot of models and model parts. LAIKA uses 3D printers, specifically the Stratasys J750, to create facial animations for the models they use. Each successive shot or frame of film needs to be consistent with the one before it or the illusion of continuous motion doesn’t work. In traditional animation that means drawings, but in stop-motion that means the model or models you’re photographing, so the need for reliable and repeatable model parts becomes increasingly important. Especially on the scale used in a feature film. For this latest film, LAIKA established such an efficient workflow with their set of J750 printers, that they were able to effectively print/fabricate the needed components for one shot of the movie, from storyboard to model, in just a few days. A “pixel” is the smallest element of a digital image. By combining multiple pixels, you can create different colors, textures and patterns. A “voxel” (or volumetric pixel) can be imagined as an extruded pixel. Similar to a pixel they can be combined to have different colors, however because they are tangible objects they can also be combined to create different material properties, like rigidity and transparency. Controlling voxels during the 3D printing process can result in a massive range of color and composite material options in the final output. Due to LAIKA’s long history with Stratasys, they were allowed early access to Voxel Print on the Stratasys J750 and used the technology extensively when creating the models and components for "Missing Link". 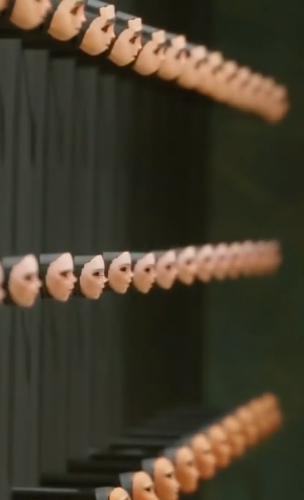 The result of LAIKA’s desire to create unprecedented stop-motion animated performances has led them to continuously push the limits of the 3D printing technology they use. “The only reason we do what we do is for the performance,” said McLean. “It all goes into that idea of us being able to tell stories that have never been able to be told in stop-motion animation."